I received a pushpin travel map for this review. Traveling the world is one of my greatest passions in life. 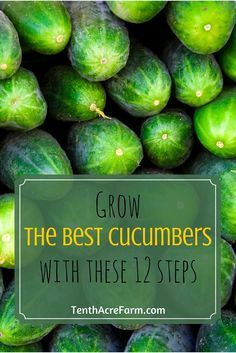 Seeing a country for the first time, tasting a new locally prepared dish, experiencing a different culture – those are the things that excite me. 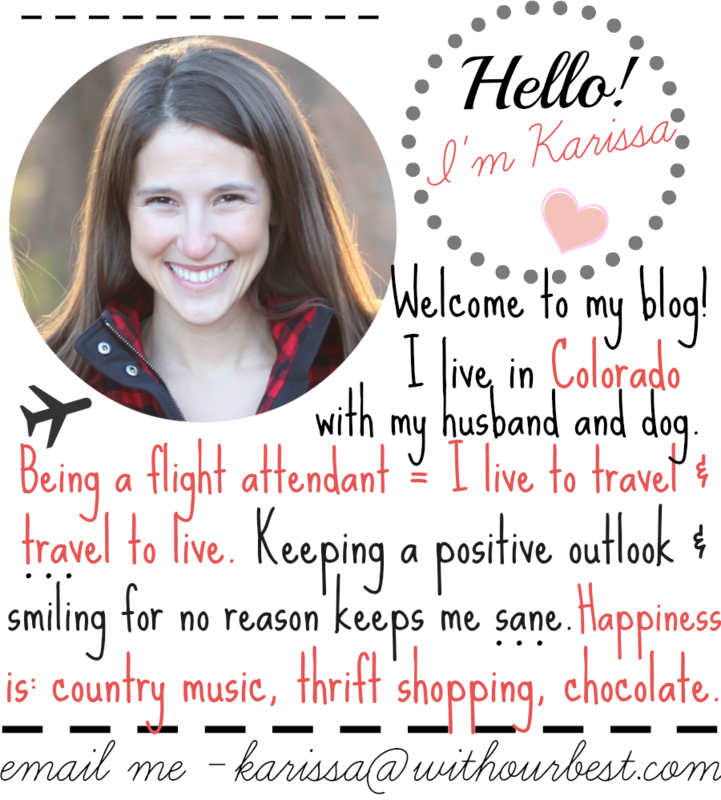 My passion for traveling started when I was a little girl, grew when I took my first “real” job as a flight attendant, and the flame of my traveling fire gets bigger and bigger as I travel to each new place. I can’t get enough of this AMAZING world! Being the avid-traveler, I find it fun and entertaining to track my travel destinations. I have used an online map for awhile, but that is nothing compared to the real life travel map hanging in my office. When I first saw the pushpin travel map, I knew I had to have one! 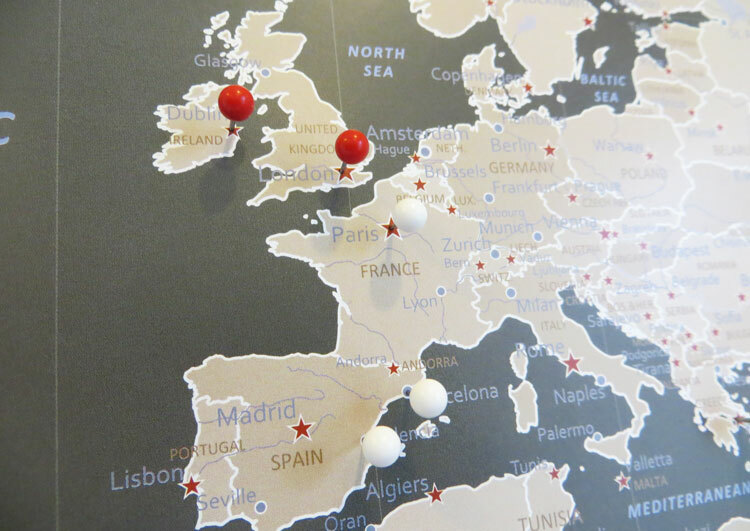 What fun it would be to label all the cities I have traveled with colored push pins! I would decide what each color of push pin meant and meticulously remember all of the cities I have seen in the world. It would bring back great memories. When I received the travel map, it was even better that I expected! This has got to be one of the best pushpin travel maps out there! First, let me start with the packaging. The map was sent delicately inside a shipping box. 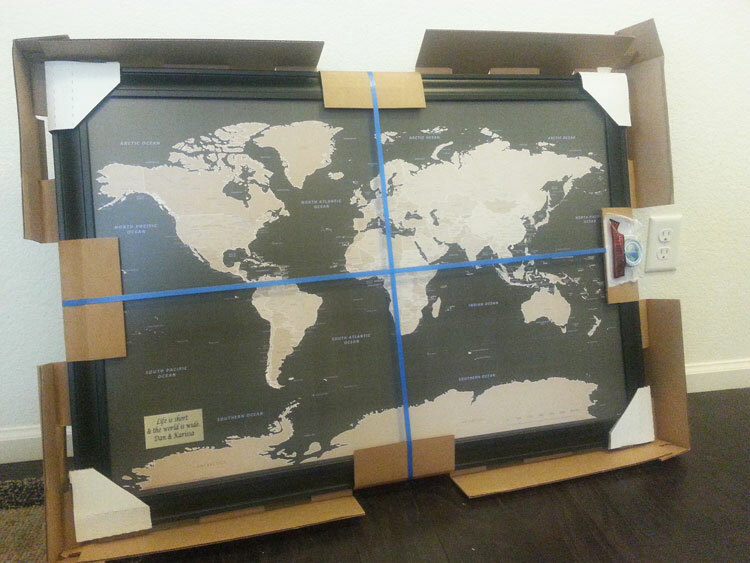 It was tightly fit with cords holding it in place, without damaging the frame or the map. It took awhile to fully unwrap this package, but I found the map in pristine condition! No scratches, dings or dents. It was perfect. I quickly noticed how stunning the map was. The map was a greyish black, the countries were a tan light brown and major cities were all labeled. Then I noticed the gorgeous placard on the bottom corner. I had forgotten that they customized this part of the map for you! 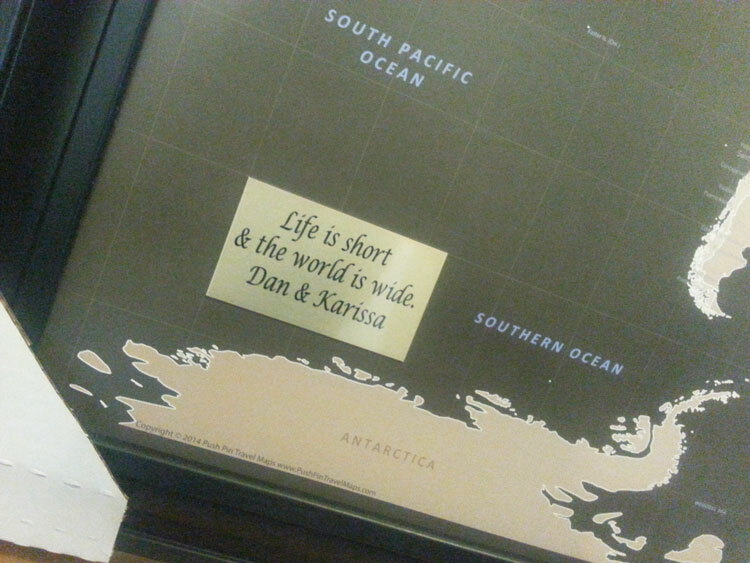 I chose the saying “Life is Short and the World is Wide” and had our names engraved with it. It was such a nice personal touch to this travel map! 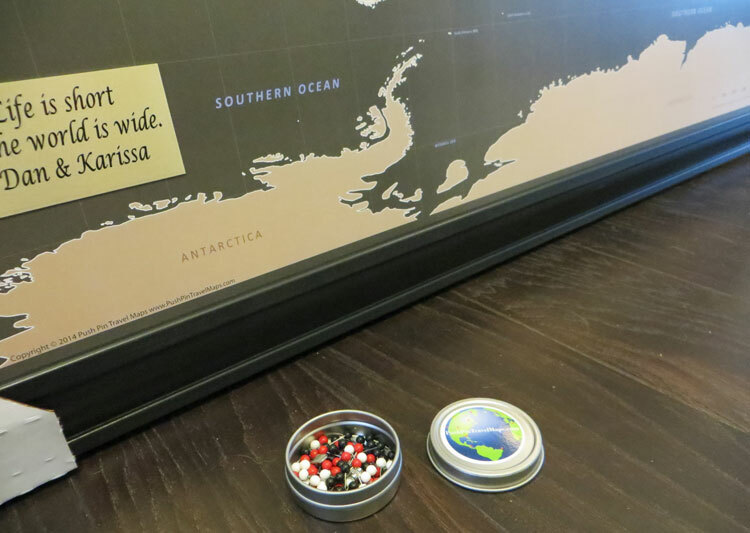 Included with the map was a little round tin that had mini pushpins (white, black, red) so that you can pin the cities you have visited or wish to visit. We decided to use all the colors to indicate different things. The white was for places I had traveled to solo. The black was for places my husband traveled solo. Finally the red pushpins were going to indicate the places we had both been (either together or separately). 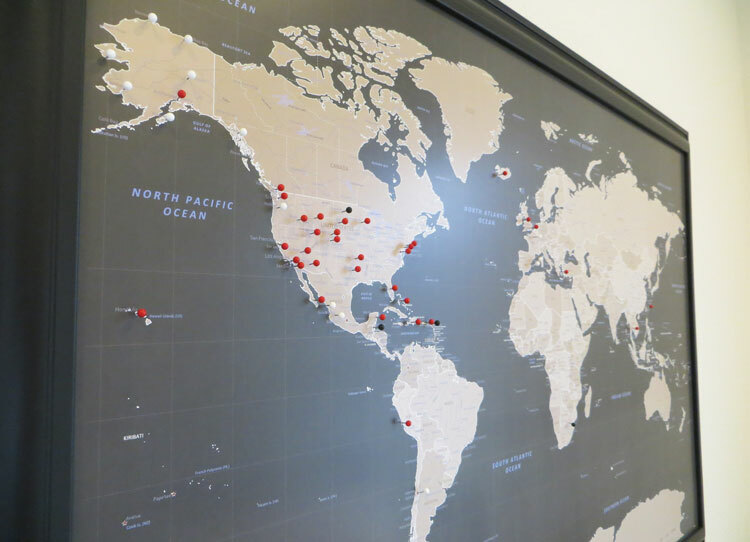 Some of the places we pinned red (together) were Bangkok (Thailand), Lima (Peru), Honolulu (Hawaii), Reykjavik (Iceland), Athens (Greece) and Dublin (Ireland). We hope to pin a lot more countries over our lifetime. We hope to visit each continent before we die! It is so fun to have this travel map from Push Pin Travel Maps to remind us of how many fun places we have been in the world! 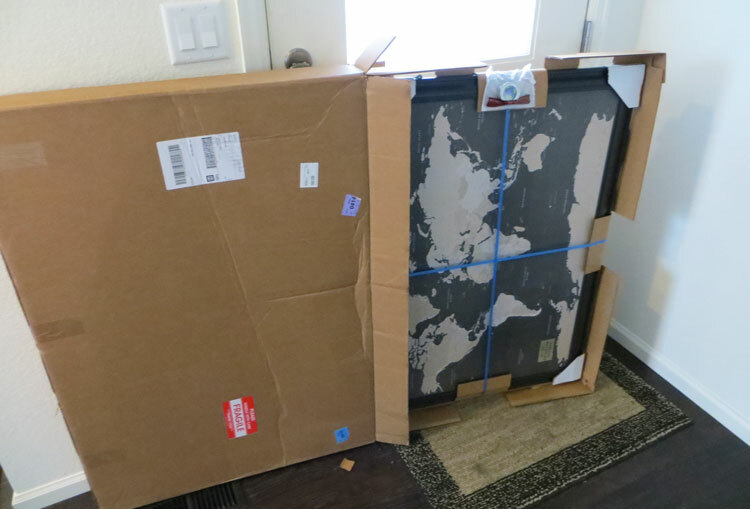 It is a gorgeous world map – and now is a piece of art hanging on our wall. This world map is such great quality, and I would recommend it to any traveler who would similarly want to pin their travels on a world map. I am so happy with this product, I can’t stop starring at it! CONNECT: Join Pushpin Travel Maps on Facebook, Twitter, and Pinterest. BUY IT: You can get this very same pushpin travel map or any of their other pushpin world maps on their website, Push Pin Travel Maps.